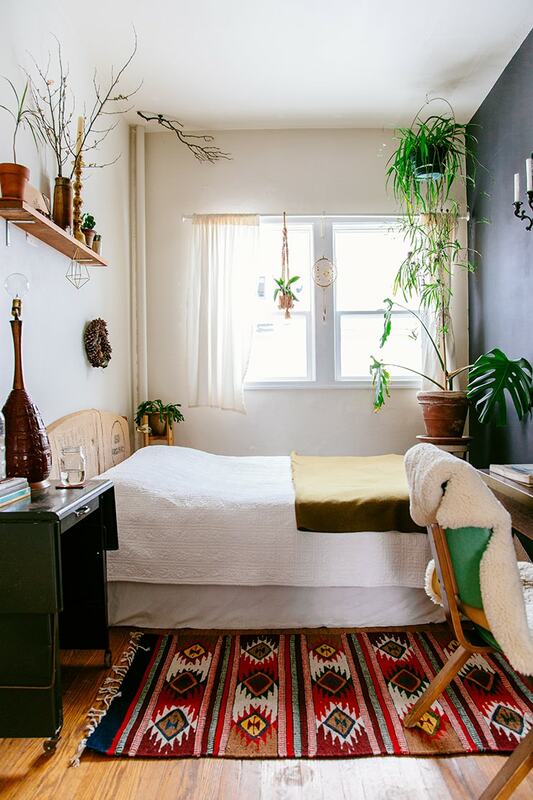 I have a thing for tiny bedrooms. I guess it’s because I’ve never really understood the need for a large bedroom, since it’s a space with a designated purpose—what more do you really need than a place to be horizontal and put your clothes? I wonder how many people actually use bedroom “sitting areas” instead of just chilling in the living room. Doesn’t this look so cozy?? It’s like sleeping in a little cubby. 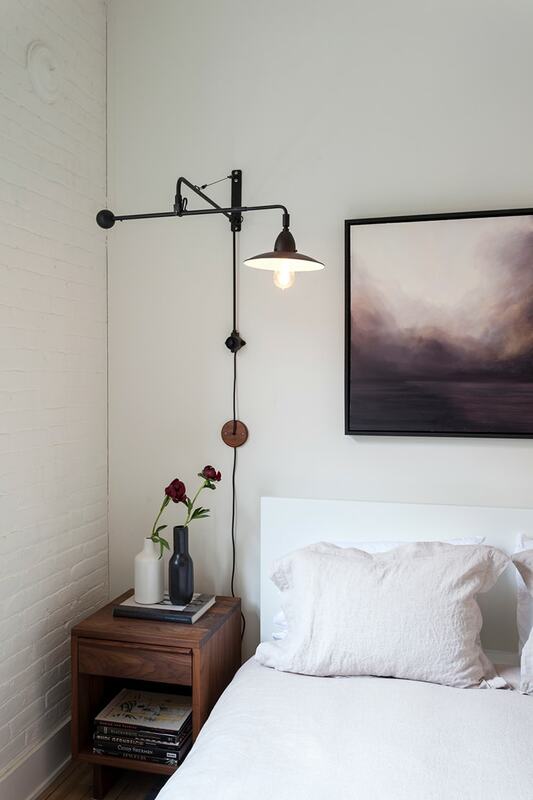 I especially like the skinny corridors on the sides of the bed—my bedroom in Portales was like that (albeit with a king size bed), and I loved how it felt going to sleep so close to the wall. Is that weird? I saved this one for last because the textures and the colors (and the black String shelves!) are just too perfect. That dark gray wall makes the space. I’ve been saying this for years, but if you have a tiny room, paint at least one wall (or the ceiling!) dark. It will make that surface recede and add so much visual depth to the space. Really. Yesss I always like reading your blog, thanks for picking it up again! I fully agree about not needing a large bedroom (my bedroom doesn’t even have place for clothes and that’s maybe for the better because I have to get up way earlier than my partner). I wouldn’t mind being able to get out of bed without climbing over someone though, that’d be a goal for the next house. 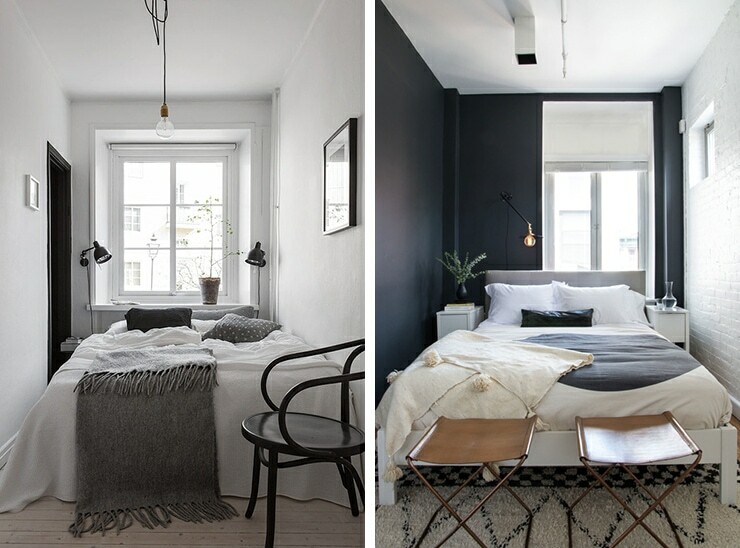 If you’ve a tiny bedroom with a very high ceiling do you still think painting a dark wall is a good idea? 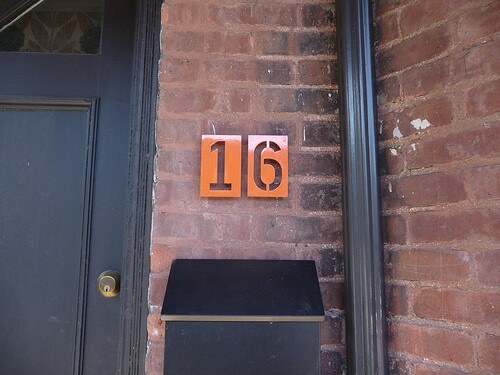 Yes, BUT: I would suggest continuing the dark color down the wall a bit—at least a foot. I did this in one of my very small bathrooms years ago, and the effect was spectacular. It made the room feel both wider and cozier. Here’s a post with some photos! Really interesting! Thanks. We have a picture rail, so coming down the walls a bit would make sense too. Thanks for sharing the bathroom, I hadn’t seen that post. I have missed this wonderful blog. Add to this the fact that I’ve just bought my first home with a much-larger-bedroom-than-before and haven’t been getting great sleep, and you’ve basically solved the mystery of me not feeling great. Bedroom is too big! It’s not huge but I feel like I’m sleeping in a ballroom. It’s a ridiculous non-problem to have, I realise this. But – I now wonder if there’s anything I could do to re-cosy this overly spacious room, without dividing it up and regretting it. Fiona, I wonder if there’s something you could do with folding screens that would section off parts of the room and make your sleeping area feel more intimate? I was just admiring this Eames-esque divider at Urban Outfitters the other day and thinking it would be so pretty in a bedroom. I’ve also seen homemade canopies (like this one at the Joshua Tree House) that have a similar effect. Just a couple of ideas! Yeah, UO is extremely hit or miss when it comes to furniture. This particular piece seems like a winner, though! Oh my gosh, that divider is already sold out!! I wonder if they only had two?! My bedroom is SO TINY, it fits a full-sized bed and a nightstand and that’s about it. No closet either! But after decades of living in studio apartments, I LOVE MY TINY BEDROOM so much. Anna’s back in action, yay! 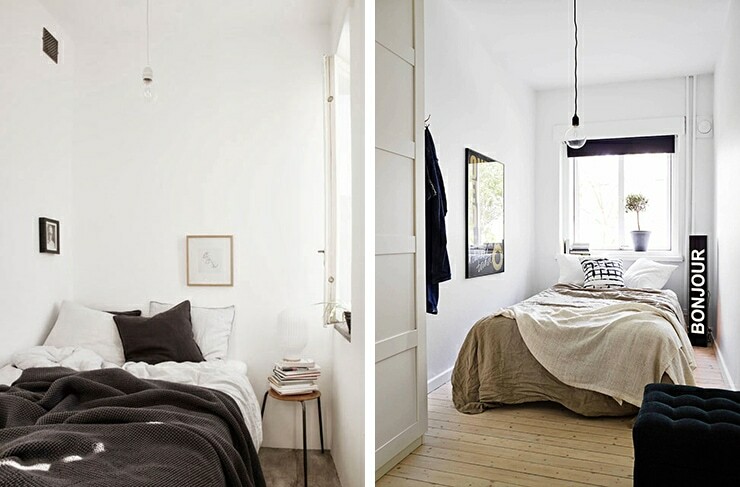 I had the second image pinned to my inspiration board forever because my bedroom was the exact same size and layout. 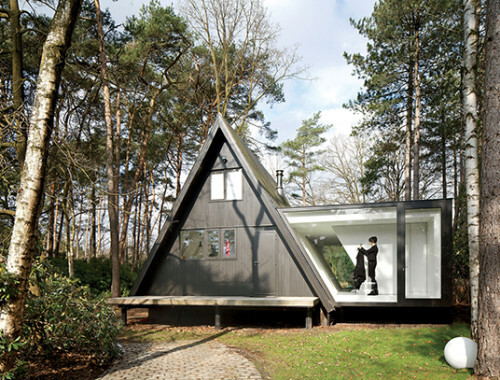 It made me feel cozy and weirdly protected, but it’s definitely a design challenge! So glad I will have the pleasure of reading your blog again! I moved into an RV recently and plan to paint my entire tiny bedroom, including ceiling a very dark blue. Fun to see all this tiny space inspiration. 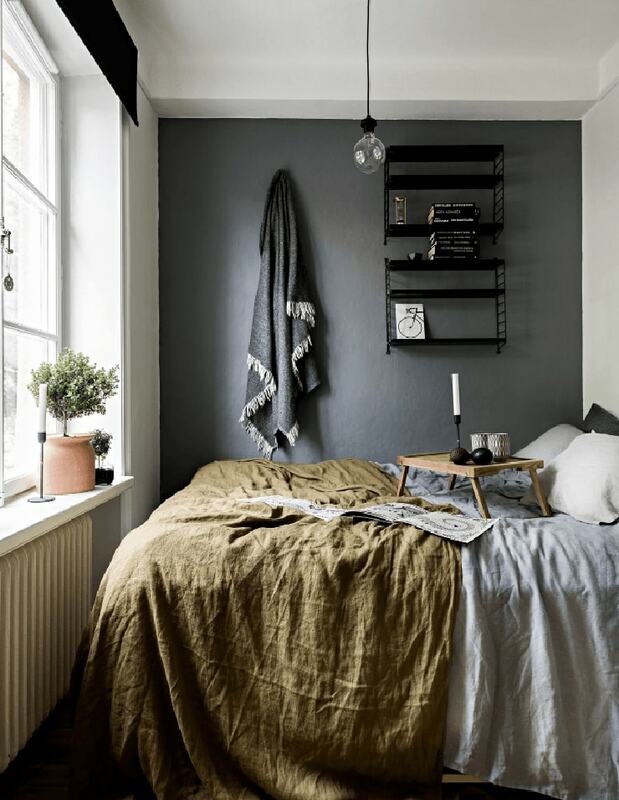 Kind of off topic but has anyone found a style similar to String shelves.I have long dreamed of a wall full of them but that’s not in the budget. June, I wish I could recommend a specific similar shelf system that’s still being manufactured, but I don’t know of one. That said, vintage furniture store DO often have knock-offs (like the ones I used to have in one of my Brooklyn kitchens), but that makes it tough to plan a whole wall of them. 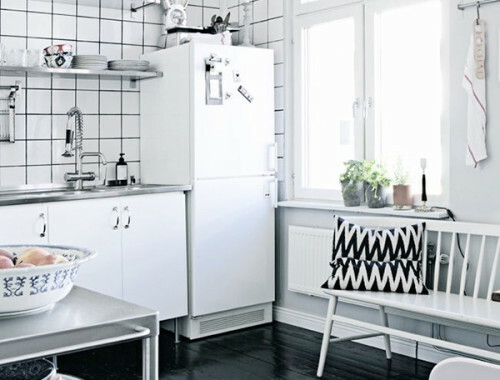 You might want to consider something like IKEA’s SVALNÄS system—I know it’s not exactly the same look, but there are a lot of options and the price is very, very good. Funny, I actually did look at that IKEA. system. It’s okay but I’m still holding out for something more. I hate to say I’m endorsing for more knockoffs in this world…. but there really isn’t anything quite like the String. I’m so glad you said that. We are renting a house with a huge master bedroom and it’s such a waste of space. We are downsizing to a small place and decided to give the kids the master bedroom while we’ll take the smaller bedroom, so I needed this small bedroom inspiration today! That last image is just perfect. I might need to use it for future color palette inspiration in my own bedroom.